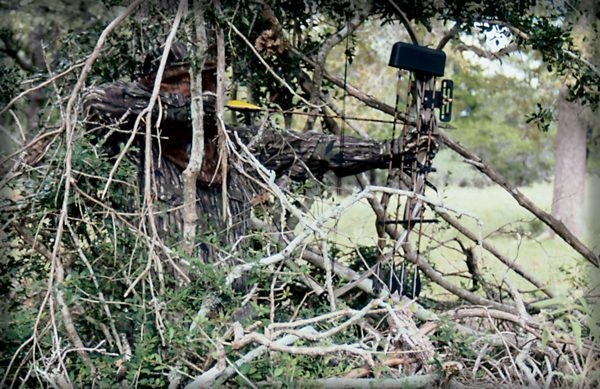 Successful early season bowhunters have to be experts in the art of the ambush. Archers must scout for places to ambush deer at ranges less than 50 yards. Thus, by its nature, scouting for bowhunting is much different than scouting for firearms deer hunting. Further, because most bowhunting is done earlier in the year than firearms hunting, the places deer are concentrated often are different than when modern guns can be lawfully used. In addition, much bowhunting in Texas begins before whitetails start rutting. So locating a scrape line and hoping for a love-crazed buck to wander within range is not realistic for many archers. Blanton says water often is a key element in locating deer concentrations for early bowhunting. Texas weather is often still plenty hot when archery hunting begins. Places where there are tanks, creeks, canals, lakes and beaver ponds offer deer water, which they need in hot weather, as well as cool areas for comfortable daytime bedding. Further, in most places where it’s wet, vegetation is very thick—-and these are places deer, especially bucks, favor. “Texas is so big, and the terrain is so varied, that there are no ‘absolutes’ regarding how, when and where to bowhunt Lone Star whitetails,” says Cecil Carder, president of Advanced Marketing in Fort Worth, and a member of the Mossy Oak Camouflage bowhunting pro staff. “But for a chance at a nice buck with a bow, you’ve got to get away from open areas, and hunt the thickest, most tangled cover you can find. The typical Texas hunter works in the open where he can spot a lot of game. But to take a quality animal with a bow, the best place to put your tree stand is on an oak ridge with acorns on the ground, that has heavily-used trails through a lot of thick cover. And you’ve got to use top-notch camouflage, like Tree Stand Mossy Oak, to blend in with the cover so deer don’t see you. “It should be so thick you can’t see very far from the stand. Most of your shots will be under 20 yards. This is one reason many people don’t like to hunt in thickets, but that’s where old deer live, and it’s the best place to take a quality buck with your bow. Hunting one such thick place in Central Texas a few years ago, Carder spotted a huge buck slipping through low-brush terrain, and soon an enormous 10-point buck stood broadside at 15 yards. Carder drew his bow and sent a broadhead on its way. The arrow found the 170-pound buck’s heart, and the animal went just 70 yards before falling. The 2 1/2-year old buck’s near-perfect 10-point rack easily made the Pope and Young record book, netting 142 6/8-points. Hunting around food sources is a common and very effective way of hunting deer for all sportsmen. But bowhunters are in the woods sometimes a month or more before firearms hunters and frequently must locate the early-season foods that deer are using. Water oaks, laurel oaks, willow oaks and overcup oaks are among the first trees to drop acorns and are a preferred food for whitetails living in lowlands. Other prime early-season deer foods that archers should look for during scouting include: persimmon and apple trees, honeysuckle hedges, honey-locust tree seed pods, and greenbrier plants. Bowhunters must scout out places where they can ambush a deer at ranges less than 50 yards. Bowhunting in Texas begins before the whitetails start rutting, so it just makes it that much tougher to get a quality buck. Most good deer hunters know whitetails love acorns. But there are many times in early bow season when acorns aren’t ripe and falling. That’s when an archer’s scouting becomes most important. Still-green grain and clover fields are often favorite deer feeding places in early season, but usually at night. Yet fields still are good places for a bowman to begin his search for a stand site. By walking field edges, hunters can locate trails leading into fields from wood lots. By scouting trails from fields back into heavy timber, archers may find an ideal location to place an early-season tree stand. Deer often don’t start moving around until late afternoon because it’s so hot during archery season. Early in the bowhunting season, many deer sign in the field at night rather than day. That’s why getting far back into woods off fields is best for hunting. A bowman has got to be far enough off a field and near a whitetail bedding area that deer walk past his stand before it gets too dark for lawful hunting. When getting ready for bow season, it’s a good idea to keep in mind that Murphy’s Law was written for bowhunters. That’s because anything that can go wrong when a buck is 20 yards from your stand, will go wrong. Thus it is an archer’s mission to ensure that nothing can go amiss during close encounters with whitetails. Yet even when a bowman believes all is perfect for a deer ambush, something still can go awry. For example, I remember one buck I muffed a shot at because of dirty arrows. My stand was perfect. The wind was just right. The woods were quiet, and the trail I hunted was well-used. When a 6-point buck stopped right at the spot he was supposed to, 18 yards, and dropped his head to pick up acorns, I believed the deer was mine. That’s when Murphy showed up. As I drew my arrow for the shot, the aluminum shaft slid across my metal springy rest (all correct) and made an ear-piercing squeal that sent the buck straight up in the air with eyes as big as Billy Joel’s. He landed on all four hooves facing back up the trail on which he had arrived, and in a few short bounds was completely out of sight. The springy rest had a coating of rubber to prevent such a squeal. But that afternoon before going to the stand I shot a few arrows into a sand bank for practice, but failed to clean the fine sand from the shafts. So as my arrow was drawn, sand accumulated on the springy rest, scratched the aluminum shaft loudly, and one more buck I should have taken is still browsing the Texas oak ridges. Sounds that are subtle and almost indistinguishable to most hunters sound like a chain saw at daybreak to deer in bow range. For this reason, a smart bowhunter inspects his tree stand for squeaks and creaks long before taking it to the woods. A little dab of moleskin or spray of corn (correct) oil to noisy metal parts can quiet stand sounds that spook deer. Sometimes a tree stand also must have bolts tightened or wood or metal parts replaced to make them quiet. Similar “quiet tuning” must be done to a hunter’s bow. Coating the arrow shelf with moleskin, using string silencers and rubbing bow string wax on a cable guard helps silence a bow. Minor movement by a hunter is a major alarm to whitetails at close range. Just because your stand is 20 feet high, don’t believe that deer can’t see you. They do look up, especially old and wise deer—-despite claims to the contrary. Complete camouflage that perfectly matches hunt terrain is recommended. Even with good camo, move only when the animal is looking away, has its head down feeding or is in cover and blocked from viewing you. Should a deer look directly at you, freeze. Some bowhunters even believe they never should look directly into the eyes of a deer looking at them. When a nearby deer “eyeballs” them, they shut their eyes, believing the animal can see the unnatural glassy reflection of their human eyes. Sometimes a “Mexican stand-off” with whitetails can last many long minutes, and holding a bow at the “ready” position can be very tiring. A “bow holster” that supports the lower limb of a bow held vertically and ready for a shot can save the day when a wary buck is scant yards away. Finally, be sure your bow and arrows, broadheads, stands, flashlight, pull-up bow cord and all other gear are in good working order long before you head to the woods for hunting. Nothing short-circuits a bowhunter faster than faulty equipment, because you’ve got to stay focused completely on taking deer with a bow — not worrying about whether gear will work when it’s called upon.